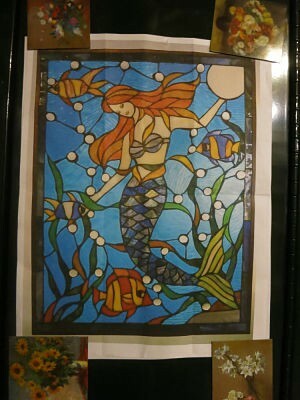 I’ve always been fascinated by mermaids. I couldn’t resist adding a fine specimen that I found on the internet to my “must do” list. I could not find any reference to the original artist… the image came from e-bay… “SOLD” was all it said. I modified the pattern slightly as a couple of the original fish had very strange fin formations that I just could not live with, being ex -aquaculturist. I started cutting the background pieces in late September 2015 just before Monica and I went to Ireland. I didn’t expect to get much done prior to our trip but once I got started, I just couldn’t stop and got most of the piece cut and ground to fit before we left. That meant I would have this wonderful foiling project waiting for me when we returned. Back from Ireland (amazing trip) and couldn’t wait to get into the studio. I spent a happy and inspired four or five hours Sunday cutting and grinding the four fish and border. Washing the entire panel in preparation for foiling was a challenge in not mixing up any of the pieces (they would be a curse to puzzle back together again if the entire thing got scrambled). Foiling this project was the most relaxing couple of days since our trip. With feet up for three or four hours a day, I just let my mind wander as my fingers worked away burnished the copper foil onto each piece of glass. Occasionally to break the silence, I would watch a Netflix documentary or chat with Monica as she edited trip photos for future scrap booking. I love foiling… I think I’ve mentioned that before. The entire panel grew by a few millimeters with the addition of the copper foil. I have seen that before but this panel having so many small pieces ( 273) really accentuated the growth. Soldering took place all on on day over 8 hours (Sunday Oct 25). I got good practice on this panel with so many small pieces and was pleased with the results. Looking forward to hanging this beauty in my washroom downstairs…it looks totally different from day time to night time.